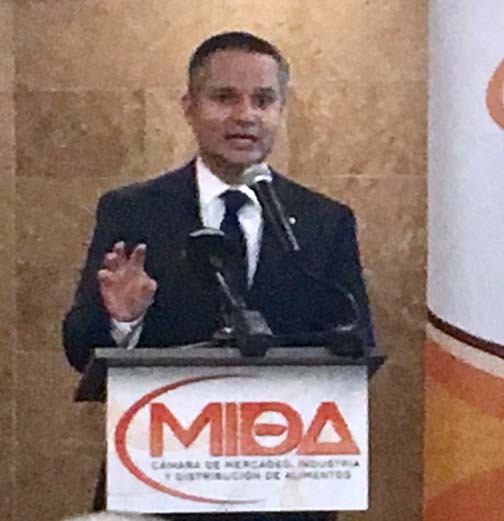 A snapshot of the study released Thursday showed that theft by employees and customers represents 30 percent of the drop in sales the industry has experienced, said CPA Eduardo González-Green, during a news conference held by MIDA. The most susceptible items to theft in grocery stores are liquors, followed by coffee, deodorants, seafood and cheeses, as revealed by the research commissioned to the Aquino, De Cordova, Alfaro & Co. firm. The full results of the study will be revealed in June, during MIDA’s annual convention. This is one of the trade group’s main initiatives, to offset the loss of income facing this sector. “The profit margins of retailers are minimal. Therefore, any loss can dramatically impact a company’s finances,” said Manuel Alfonso Reyes, executive vice president of MIDA. The data revealed by the study estimate that the average sale per customer amounts to $25.66. Of that, only 23 cents per customer represent the net profit for the retail establishment, the study showed. “The theft of merchandise in stores represents economic losses to businesses. But it also brings losses to the government’s coffers and the economy in general,” Reyes-Alfonso said. “Treasury loses the sales tax, plus the cost of managing an inventory that never reached the consumer and the consumer loses because that loss is included in the price of goods. Ultimately, we all lose,” said Reyes-Alfonso. Given this reality, MIDA brought together different resources to analyze the situation and find solutions to implement at the points of sale. An analysis concluded that the trend established by supermarkets to keep vulnerable products locked in a case or within inaccessible areas represents a greater loss than the shoplifting itself. Therefore, Luis Jiménez- Jiménez, manager of a category representing coffee brands like Yaucono, Crema, Rico and Alto Grande, recommended a balance in implementing preventive measures between the interests of retailers and manufacturers, and the consumer shopping experience. “When the balance is tilted too much toward protecting inventory and profits, the consumer may decide not to wait for an employee to bring the key and takes their money to another establishment,” he said. “This reduces sales by about 20 percent, which equates to a loss of about $1 million,” Jiménez said. According to available data, the coffee category represents $70 million in sales, making it the fourth most important category for grocery stores. Reyes-Alfonso urged the government to take action by creating laws giving law enforcement authorities more “teeth” to handle those who break the law and more protection to retailers. But while that happens, retailers can take a number of internal measures to reduce incidents and losses, he said. That goes from buying new technology that allows early detection of suspicious activity and hiring private security, to moving the most vulnerable products to the customer service area or in front of cash registers, as in the case of deodorants and coffee. In the case of deodorants and other items, the group presented alternative displays that provide security without actually putting the items under lock and key. “It’s important to prevent theft, but we must avoid penalizing consumers and discouraging the sale, as the economic loss may be higher. The solution should not affect the customer buying experience because it will affect sales,” said Jiménez. Meanwhile, retailer said the majority of supermarkets are ready to comply with the law banning the use of disposable plastic bags starting in June. P.R. will soon show its owner’s in the U.S. Congress how the 40% who already live in local enclaves survive by growing their own food and barter exchange with a wad of dollar bills in their pockets will expand to include many more that do not flee to the states for better welfare when their government agency shuts down. Those in cities without land in which to grow survival food will grow fish to eat and feed plants growing on vertical towers with minimal use of rain water collected. Sun will power LED and this computer until your time comes past next week’s 85th b.d. Hey Buddy!, I found this information for you: "MIDA: Food retailers lose 6M to shoplifters in PR". Here is the website link: https://newsismybusiness.com/mida-retailers-shoplifters/. Thank you.